I LOVED this book. And it made my heart ache so much for all the injustices the Nazis committed, especially toward children. The story is told from the point of view of 12 year-old Nadia who arrives in Ontario, Canada in 1950 after the end of WWII from the Displaced Persons’ camp, where she has spent the last five years. As she adjusts to a new country, new language and new parents who have risked their lives to save her, Nadia suffers nightmares and flashbacks of the things she has endured. She is confused about who she is. As her story unfolds, the pieces of the puzzle of her identity and how she ended up in the Displaced Persons' camp are put together, and we get the full picture of what actually happened to her and her family. Although truthful about what occurred during WWII, the book is not filled with detailed violent scenes. However, I will wait before letting my daughter read it. It can be scary for children to realize that they can be stolen from their parents in the middle of the night in their own homes. Despite this, the story shows how courage and love can motivate people to help and risk their lives for one another during periods of extreme duress. It can also teach our children not to make fun of immigrant children because we have no idea what they may have suffered and escaped. I would highly recommend this book for in class reading and discussion as part of learning history in the school curriculum. Readers are certain to find this book enlightening, intriguing, suspenseful and hopeful. For me it was also heartbreaking as I imagined the pain of thousands of parents who have lost their children under a cruel regime. Oh my gosh, that does sound horrific! I've never heard of it before. Thanks for the review. 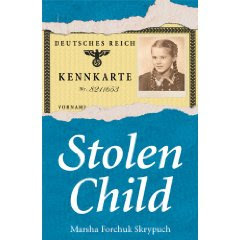 I am thrilled that you found Stolen Child a powerful read. It was a difficult novel to write. Thank you for the great review! You're very welcome, Marsha! Thanks for visiting my blog and for linking my review to your Website. I am honoured. I'm really looking forward to reading this book. I am sure that I, too, will find it as powerful, engaging, and deeply human as I have found Marsha Skrypuch's other books. I think you made a really good point, Laura, in seeing how such books not only illuminate particular events in history, but serve to broaden understanding and develop empathy for contemporary events and experiences in the lives of some modern children (such as those immigrant children which you mentioned.) They give readers insight into and inspiration from perennial human values such as compassion and courage. Thanks for visiting my blog, Gary. Marsha is a new author to me and I'm glad to have discovered her. Books open up new worlds to our children, and if they can teach compassion and empathy as well, they always have a special place in our home bookshelf. I have been wanting to read this book. Good review.